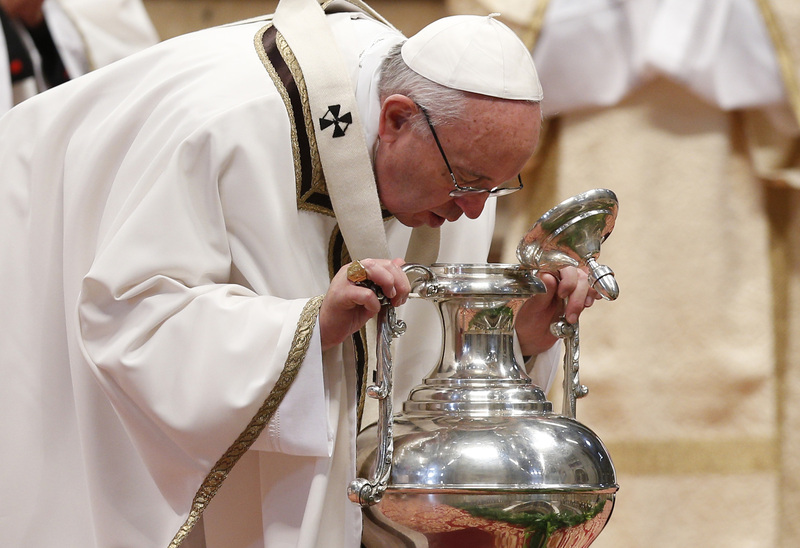 On the morning of Holy Thursday, Pope Francis celebrated the Mass of Chrism at St Peter’s Basilica. During the Holy Mass, the Holy Father blessed the sacred oils (Chrism, the oil of catechumens, and the oil of the sick), which will be used during the Easter Vigil, and in liturgical celebrations throughout the year. In his homily during the Mass, Pope Francis once again on the theme of mercy, speaking especially of two areas in which the Lord shows “an excess of mercy”: in encounter, and in forgiveness. This was the way of the Good Samaritan, who “showed mercy” (cf. Lk10:37): he was moved, he drew near to the unconscious man, he bandaged his wounds, took him to the inn, stayed there that evening and promised to return and cover any further cost. This is the way of mercy, which gathers together small gestures. Without demeaning, it grows with each helpful sign and act of love. Every one of us, looking at our own lives as God does, can try to remember the ways in which the Lord has been merciful towards us, how he has been much more merciful than we imagined. In this we can find the courage to ask him to take a step further and to reveal yet more of his mercy in the future: “Show us, Lord, your mercy” (Ps 85:8). This paradoxical way of praying to an ever more merciful God, helps us to tear down those walls with which we try to contain the abundant greatness of his heart. It is good for us to break out of our set ways, because it is proper to the Heart of God to overflow with tenderness, with ever more to give. For the Lord prefers something to be wasted rather than one drop of mercy be held back. He would rather have many seeds be carried off by the birds of the air than have one seed be missing, since each of those seeds has the capacity to bear abundant fruit, thirtyfold, sixtyfold, even a hundredfold.